My father gave me my first copy of The Hobbit and I quite literally read it to pieces. I read it at least once a year up through my late 20s. 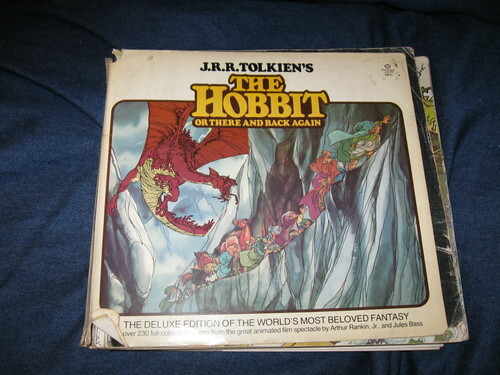 Then I suddenly had lots of books to read, and didn’t get around to rereading The Hobbit for quite awhile. In the interim, I ended up with a new copy of The Hobbit (two actually, plus Michael’s two paperback versions) and it was the new hardback book I decided to read. It was a very strange sensation, but between the new version and the fact that it’s been so long since I read The Hobbit, I felt like I hardly recognized my old favorite. Bilbo was pretty much as I remember him, although a little bit braver through the whole thing and not just under the mountain. Gandalf was also a bit of an enigma, since on this later reading I had to wonder why he was wondering around with the dwarves for so long. But wizards are an enigma, and their motives even worse. What surprised me so much on the rereading was Thorin. I remember crying at his death when I was a child, but this time I felt a bit more conflicted. He was much more of a jerk than I remembered him being, even with the explanation of the effect of the treasure on him. All of which made Bilbo an even better being in my eyes, as he was willing to forgive Thorin and accept the blame for Thorin’s anger, even though Thorin was the one who was being entirely unreasonable. So I’m glad I actually waited such a long time before re-reading the Hobbit. There’s something nice about waiting so long between re-readings that the familiar becomes once again unfamiliar and new. And although the feeling is different, reading it now I am older, I still love it was much as I did as a child, and loved seeing the patterns that made this very much a bedtime story.